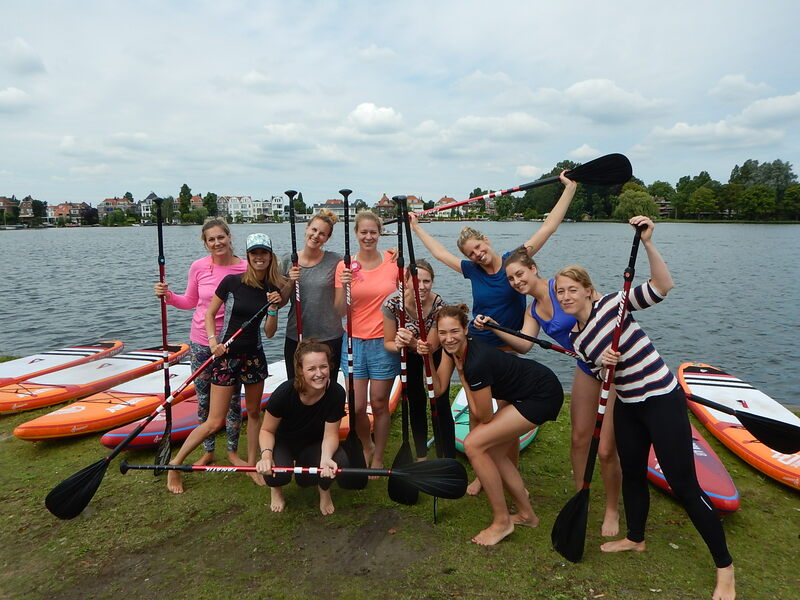 Stand Up Paddling is a great activity for a group because it is a bit challenging but fun and with some help from an experienced instructor for everyone easy to learn. While you’re out on the water, discovering the surroundings and learning something new, you also have a good time with each other and having a workout too! Our home spot for SUP classes are ‘De Bergse Plassen’. It’s is our favourite place of Rotterdam. It’s is hidden gem in the city. Supping over these lakes, with all those fancy looking houses of Hillegersberg and lots of islands to get lost around is a really unique experience. At the beginning of the lesson there will be instructions about material, position on the board, paddle-techniques and safety-issues. After that everyone will go onto the water and take a moment to get the feeling of ballancing and moving around. Then we go together on a SUPtour for about 1/1,5 hour, depending on the conditions/speed of the group. In total consinder 2 hours in your program for this activity. Afterwards there is the possibility to have some drinks or a bite at the terrace of the sailing club overlooking the lake. Advice your group to wear comfortabele sportsclothing that will quickly dry. Just bring some extra clothes for after incase you get wet. We have wetsuits but only use them in really cold / bad weather conditions. We sup with bare feet but bring some flipflops for wearing before/after…. At the sailing club WV Aegir there are facilities for everyone to use the bathroom and changing rooms with showers. If you are interested in doing a SUP-tour with colleagues, family, friends of sportsbuddys, SUP’s UP can organize this for you. We will do our best to make it a fun and memorable happening. We have allready 7 years of experience and still enjoy it every time we bring new people in contact with this nice sport.